In the picture above, top left is NE and the image covers 36.4 x 29.1 degrees. Image centre is located at 04:59:46.0, -42:30:46 (H:M:S, D:M:S, J2000) Astrometric data from Astrometry.net. Caelum (originally Caelum Sculptoris, the sculptor's chisel) is a small, rather obscure constallation hewn from rather thin pickings between Eridanus and Columba by Abbé de Lacaille in the 1750s. It is only 125 degrees square, making it 81st in area out of 88 constellations. Rather more interesting to the eye is Columba (originally Columba Noachi, Noah's dove) easily found between Sirius and Canopus. 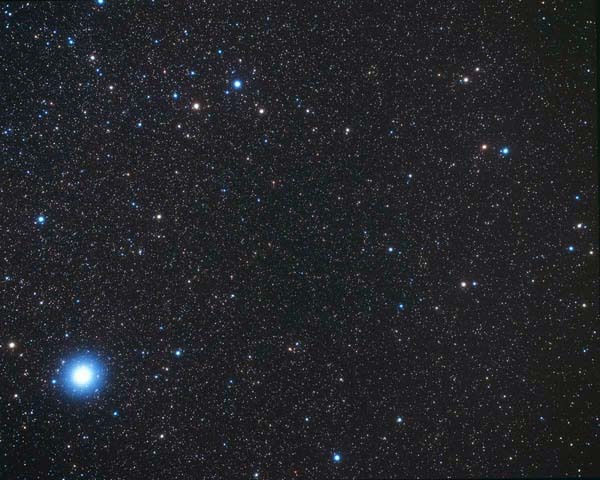 It is twice the area of Caelum and contans a few brighter stars. Information about Columba appears on a separate page. (none in Caelum) Al Kurud (κ Col), Ghusn al Zaitun (δ Col), Phact (α Col), Wazn (β Col). Carina, Circinus, Dorado, Eridanus, Horologium, Lepus (not visible), Pictor, Puppis.